After the two days we had spent in Frankfurt earlier in the month, meeting some lovely people, eating amazing food and seeing some beautiful sights, we were very excited to be returning to Germany. Where we visited was pot luck in a way. Attempting to stick within our budget, yet have a break from camping, we turned to Airbnb to seek out some family and budget friendly accommodation. 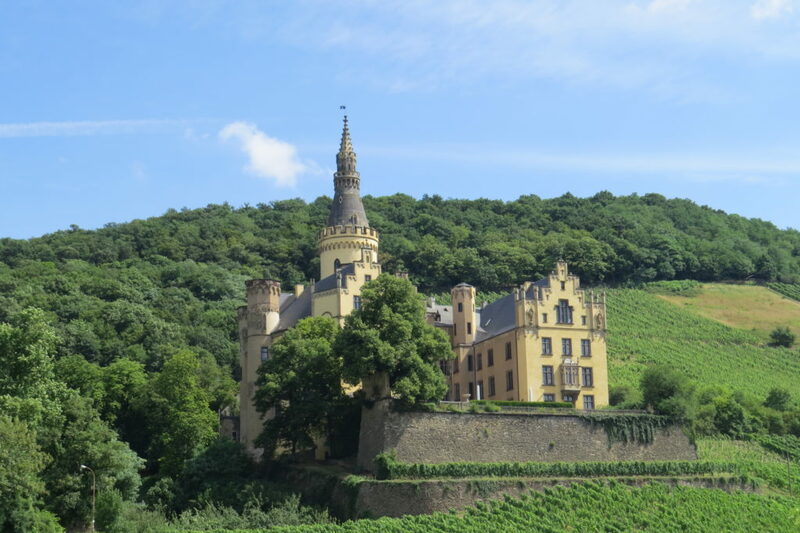 We had no particular region we wanted to visit more than any other, so we simply browsed what was on offer in Germany and found what seemed to be a great rental at a very reasonable price in the region of Rheinland- Pfalz, right on the Rhine about 30 kms south of Bonn. We spent pretty much all day driving from Belgium to our accommodation. We hadn’t got around to purchasing a GPS whilst in the UK as we had internet on our phone and managed fine using Google maps. It wasn’t until we were in a foreign speaking country, with no internet that we realised we really should have purchased one. Wouldn’t have been much good to us anyway as we discovered later that the charging point in the car had stopped working….. So anyway, with the help of road signs, Peter’s memory (from looking at Google maps the day before) and some helpful and somewhat amused random people on the street, we made our way to the picturesque town of Kasbach-Ohlenberg, and as we later discovered after looking at a map, we had taken the extended, zig-zagging, scenic route! 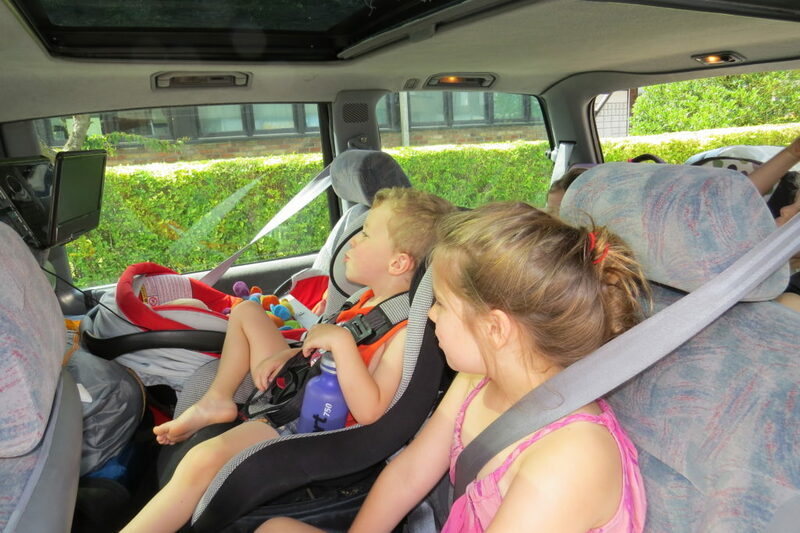 Fortunately we had set up a portable DVD player and the kids were kept occupied and entertained watching movies for most of the painfully long drive. When we finally arrived, 2 hours later than planned, we were very impressed with our accommodation. A fully furnished, 2 bedroom apartment on a quiet street in a beautiful town. The kids were so excited to have power to charge iPad’s and Nintendo DS’s and so much space to do what kids do best – pull everything out, make as much mess as possible and move on to the next room. We stayed for a total of 5 nights and left wishing we had longer. Our first full day was taken up with us behaving like the family we had left behind – doing washing and grocery shopping. It was actually really fun! We drove into Bonn where, thanks to what I will refer to as ‘the gift of getting ridiculously lost’, we drove around much of the city, before finding a laundrette. We were all basically down to wearing our last (semi) clean items of clothing and so there was a lot of washing to do. Three hours worth in fact. Fortunately there was a big playground nearby and the kids were more than happy to spend the time there. They played as they would anywhere – loudly, happily and at times emotionally and aggressively. I found it so entertaining watching everyone else watching them. I couldn’t help but break into hysterics several times as I watched confident, social Korey chatting away to both parents and other children, most of whom stared blankly at him and all of whom had no idea whatsoever what he was on about. We did a big grocery shop on our way home, enough to get us through the next 4 days of domestic living. We bought meat and veggies and ice-cream and yoghurt. I think we surprised ourselves at how excited we were about being able to purchase food which required refrigerating and cooking. I couldn’t get over the prices too. Certain items were super cheap compared to what they cost in Australia. A whole big block of Camembert cheese for 69 cents (just over $1AU), 500ml beer cans for 80 cents ($1.20), iced coffee for 49 cents (75 cents). I’m sure several people would have gone home from that shop and told someone about the weird, excitable English lady who seemed as though she’d never been in a supermarket before……….. The following day we explored Kasbach-Ohlenberg and surrounds. The Altstadt (old town) is gorgeous and a popular place to visit for tourists travelling along the Rhine. 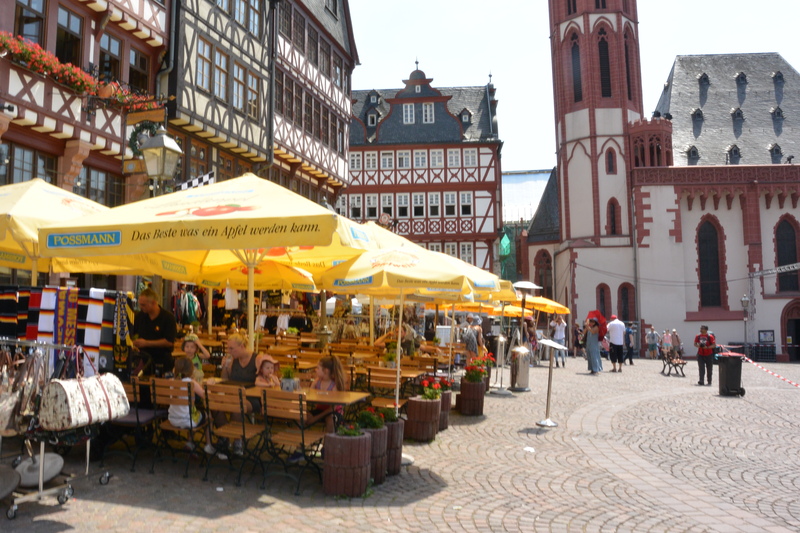 There is a square resembling ‘postcard Germany’ with restaurants and cafes surrounded by timber-framed buildings, and several streets lined with quaint little shops and eateries. We stopped for lunch at a restaurant where after very obviously struggling to decipher the menu, we were given what was referred to as an ‘English menu’. This however, was just as confusing. It was the same menu, only written beside each item was what they believed to be the English translation. This was very clearly translated by a German person who speaks little English and basically made no sense at all! It was very entertaining at least. We eventually ordered schnitzels with chips and salad. Simple and authentic! We attempted to order some water to go with our meal but were told they didn’t have any! Water was clearly not one of the words I was taught in my German classes in high school…………. After lunch we drove along the Rhine, stopping to take photos and admire the many castles and towns along the way. We were amazed by the farms and vineyards that we saw scattered on steep hillsides. Rows and rows of grape vines and other crops going up and up and up. Quite mind-blowing to think of the amount of work that would be put into establishing and maintaining them. 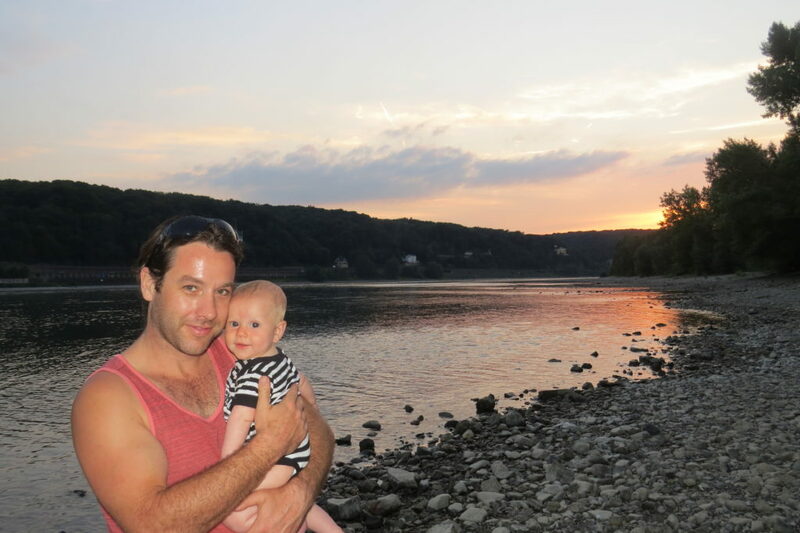 We returned to our rental for a hearty home cooked meal before venturing out again for an evening walk along the Rhine. As the sun was setting the views were spectacular and the kids happily paddled and spent ages attempting to skim stones. The weather was very warm the entire time we were in Germany. On our third day it was particularly hot so we decided to visit a nearby swimming pool that our host had told us about. Well, wow! It was awesome. An outdoor oasis, built on an island in the middle of the Rhine, it was huge and had so much to offer. A big waterslide, diving boards, a toddler area and playground and several pools of varying depths, all surrounded by expansive grassy picnic areas. 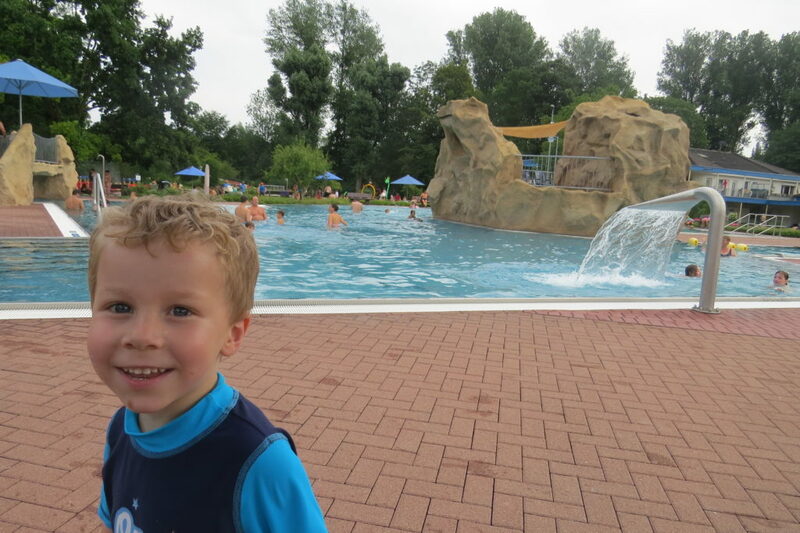 The kids had an absolute ball, including the biggest kid Peter, who got very excited when he saw the diving boards. They were also Anna’s favourite and she spent most of her time there jumping and diving off over and over again. Our last day was mostly spent packing and sorting while the kids chilled out watching movies and playing games. It was good to just have a quiet day in, especially with the knowledge that we had some serious driving ahead of us. We had decided that we would move on from Germany and head to Italy. While there was still plenty of Germany that we wanted to see and explore, the drive to Italy was a long one and we were (unfortunately) on somewhat of a time limit needing to be back in the UK by the end of August. 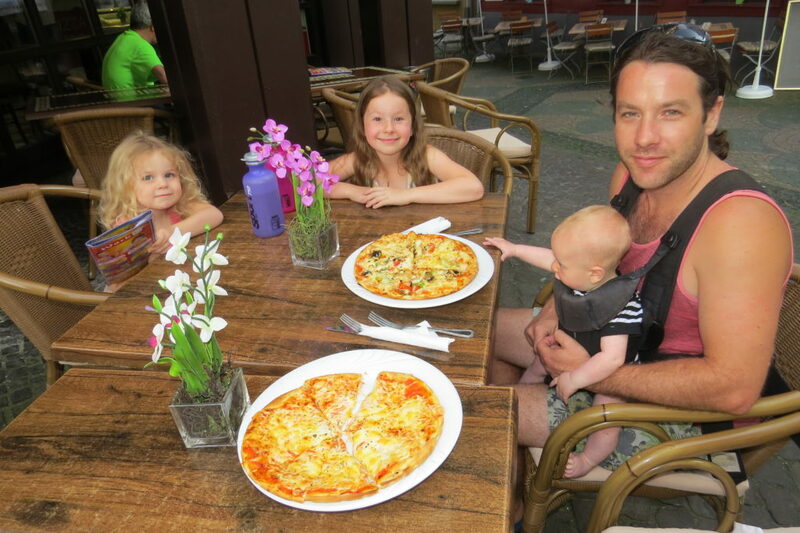 That night we returned to the Altstadt and had dinner in a Pizza restaurant. Once again, ordering was slightly tricky but we recognised most words and ordered some beautiful, large, cheap ($9AU) pizzas. So tasty and loaded with toppings, all of which turned out to be a success (except maybe the tuna which was a little bit of a strange addition on one). 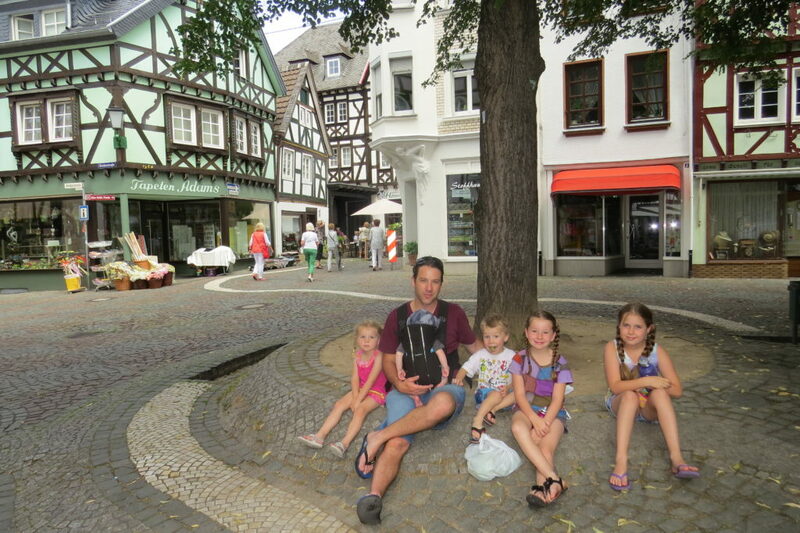 Our five days in Germany were truly wonderful. Our first experience using airbnb.com was a big success, our accommodation was brilliant, exactly what we were looking for. We had some home cooked meals and some relaxing ‘down-time’, as well as fitting in some great sight-seeing and memorable experiences. It really is a beautiful country, and the parts we saw were only the tip of the ice-berg. We most definitely plan on coming back, sooner rather than later, and seeing more of what Germany has to offer. We stayed in a great apartment in Rhineland through Airbnb. Join Airbnb with this link to save $40 on your first booking.